Rather than update the NaNoWriMo sticky post with my current (messy) thoughts, I thought I’d share a visual look at my WIP, being written through NaNoWriMo with Scrivener for Windows and Aeon Timeline for Windows. The guys at NaNoWriMo have opened up validation on wordcount earlier this year – from today (the 20th) I could validate and thus win NaNoWriMo again this year. But this morning I put in another 1800 words, and am not at the least through the meandering mess of plot that I have. So I’m continuing on, rather than validating just yet – simply because the discipline required in participating in this annual marathon appears to be doing some good in my productivity. 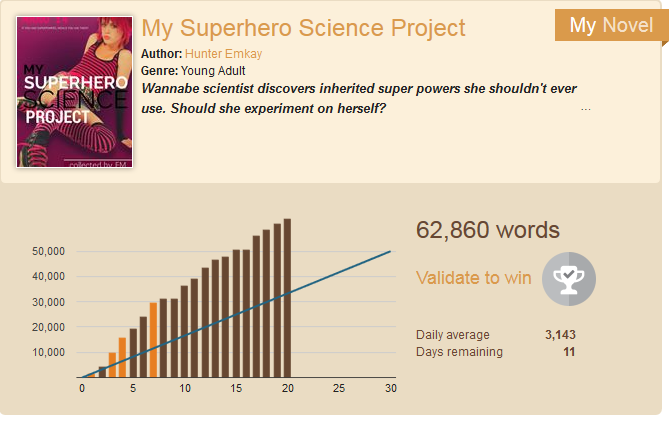 Here’s my NaNoWriMo dashboard as of today. Reminder – the title, logline, heck – everything, is surely going to change on this septic pool of murk I’m laughingly calling a work of progress. How I’m Doing It – with Scrivener of Course! There’s the clip of today’s look into Scrivener. In the binder at left you’ll see my structure and use of colour coding for my scene types (I have several types including third person close scenes, first person journal entries, and mixed media reports – told you it was messy). Below are my meta docs, everything from character profiles, setting profiles (I need to further explore adding description later on), and a recent look at my plot map, in PDF format, which I use roughly as a reference). I shared an earlier version of the same map in last week’s #52Tech post on using Grafio to diagram out a plot tube map. If I hadn’t been looking for something quite that linear, I would have gone for Literature and Latte’s other excellent tool, Scapple. For this particular novel, I’m having to reverse engineer the plot cards when I move into revising that dismal (have I emphasized enough how horrible my wip is yet?) first draft. Normally you’d see a cork board full of scene cards with a synopsis on them. But hey, this is NaNo and it’s all about word count. Below is a quick snapshot of the last scene I spat out this morning, in full screen mode. If you’re after that excellent full-screen mode wallpaper I’m using, it’s part of the bonus images available in Joseph Michael’s Learn Scrivener Fast coaching programs (all levels). 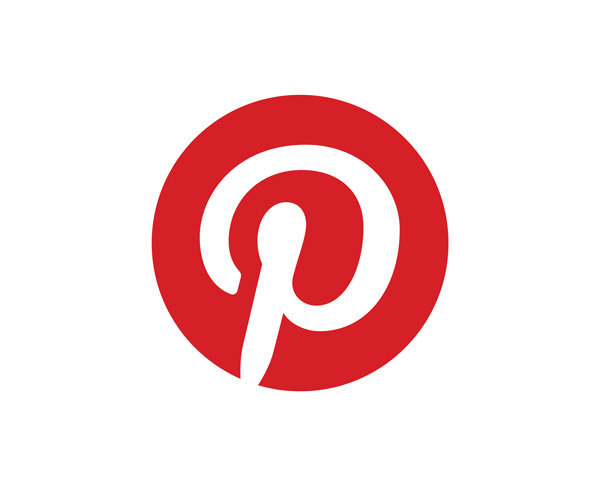 That’s an affiliate link, because – just because. Aside from all the whiz-bang customisable ways I can keep all my data together, and compile from Scrivener, I believe in this particular WIP’s case, the feature I can not do without is simply the ability to juggle scenes around between folders (in my case Acts). At the moment all my Acts contain too many scenes, and are missing critical turning points. If this was written in Word, it would be a difficult and heart-breaking task to cut and paste all those scenes into a better order. But in the future when I finally gain control of my work, it is simply a matter of drag and drop. For all of that, Scrivener’s price of purchase has no need for promotion. Literature and Latte are again sponsors for NaNoWriMo and offer a 30 day trial period of full Scrivener for anyone. NaNo winners receive a discount, which is really helpful if you’re thinking about giving Scrivener a go. Like many writers I have a huge need to track and keep maintained timelines of events and things as simple as birth dates and ages of characters. 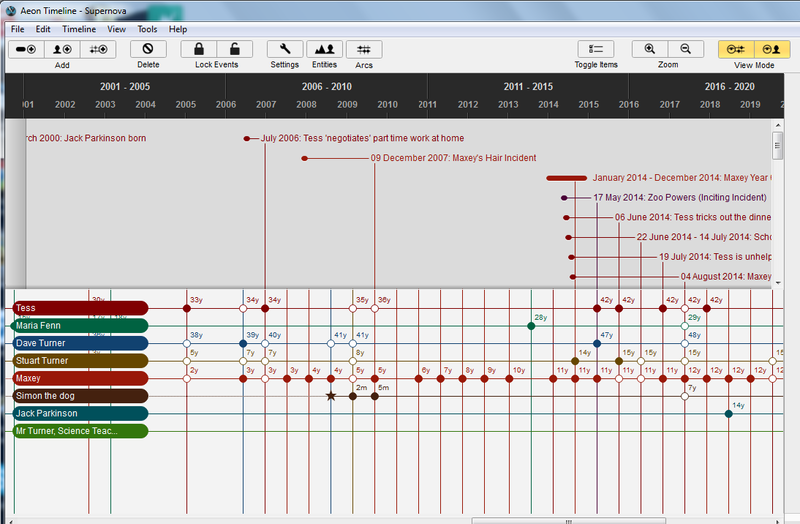 In April this year I posted about Aeon Timeline for Windows, having trialled it through NaNoWriMo 2013. I didn’t find it hugely useful, but because Scribblecode, the makers of Aeon Timeline, are also sponsors this year, I decided to give it a whirl again. I was particularly excited to find that with a big update to Scrivener for Windows in the interim (taking it functionally closer to the Mac version), Aeon Timeline can now synchronize with Scrivener. I found Aeon really useful for pinpointing backstory events, and tentatively placing story points onto a current time arc. The synchronisation through to Scrivener has created many blank cards with simply the title only. But the custom meta data brought in holds start and end dates of events well enough, but lacks things like entity (or character) cards for birth and death data. What I have found helpful is holding this timeline data within a folder in my Scrivener project, and also including a large exported png image file of the Aeon Timeline itself. 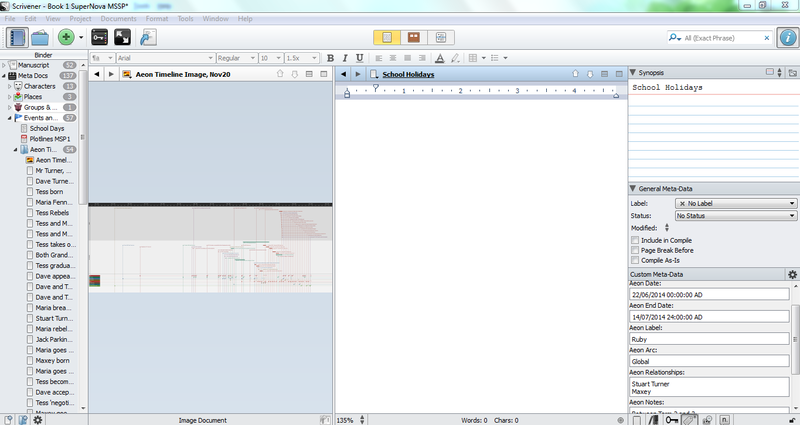 Within Scrivener I can then maximise that image file, and read it very clearly. 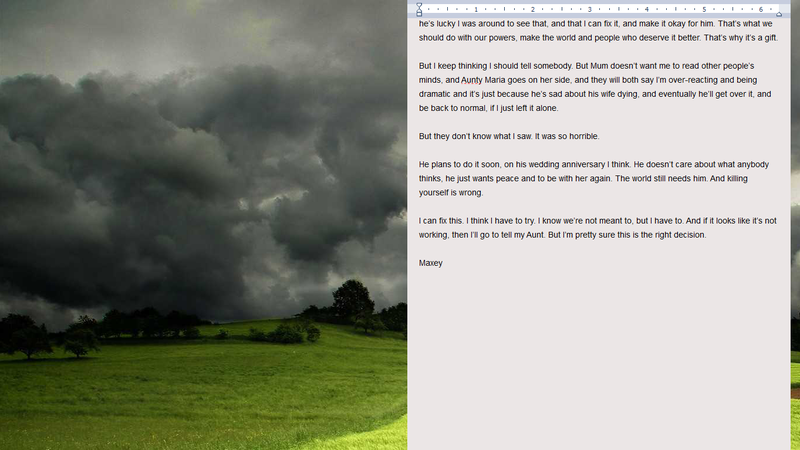 I consult both in a split screen view within Scrivener, as shown in the last clip below. In the future I will match up event dates and put my scene dates across to Aeon to get a full reckoning of characters at scene points and the time stream. My further trials of Aeon Timeline for Windows has sold me on the potential of this app, and I will be using my NaNo Winners discount to purchase. All the tools mentioned here are ones which I have learnt and used previously. They have made my NaNoWriMo writing expedition much more successful and productive, and for ones like Scrivener – for several years now. If you’re considering these tools, I recommend picking them up outside of NaNoWriMo, getting some training where available, and using them for some time before going into something like this tortuous marathon. Thank you for this! Your tips have bee very helpful with utilizing Scrivener with Aeon. 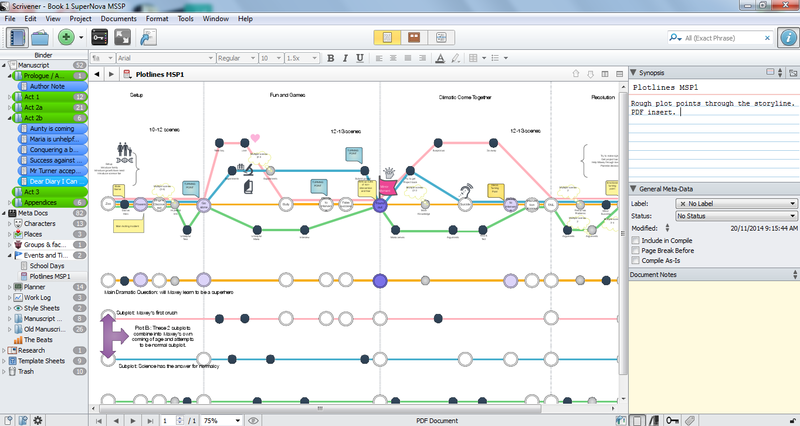 I have a question – how did you create the timeline map in the image titled “Plotlines MSP1”? If this is from a program, what program is it? It looks like it would be very useful. Thanks!